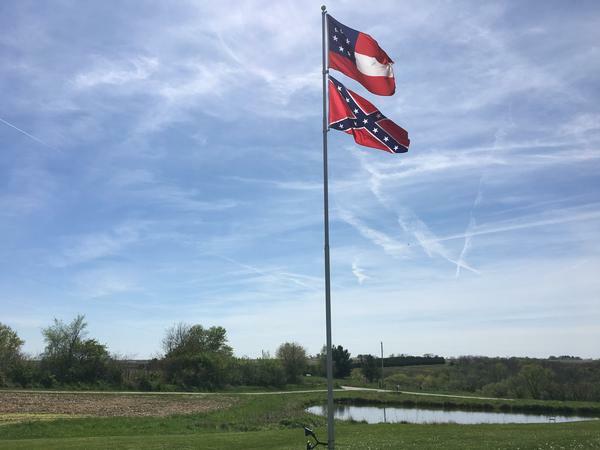 Two different variations of Confederate flags fly in Owen Golay's yard in rural Pleasantville, Iowa. 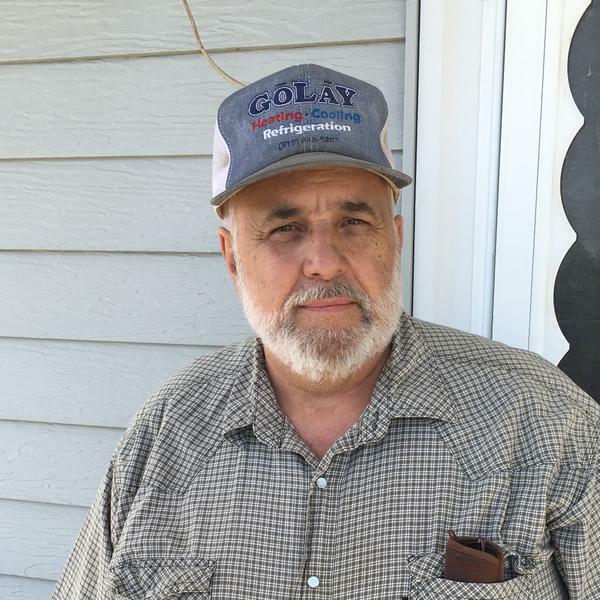 Owen Golay, 60, runs a heating and cooling business in Pleasantville, Iowa. Although he's a native Iowan, he says he's drawn to the Confederate flag and what he describes as Southern history and heritage. When 60-year-old Owen Golay talks about the two Confederate flags he flies in his front yard, he sounds like many Southern defenders of such symbols. "It stands for heritage; it's a part of our history," Golay said. But it's not really his history. Golay lives in rural Pleasantville, Iowa, about 40 miles from where he was born. He still carries a small Confederate flag that his father gave him as a child. But aside from some people way back in his family tree who fought on both sides in the Civil War, he has no real ties to the South. Golay says his interest in Civil War history and symbols deepened during the Obama administration, when he felt President Obama was overstepping his executive authority. He says he feels a resonance today with 19th century Southerners' resistance to what they saw as federal overreach. "Those people were fighting for states' rights, and the freedom to make their own way and to choose their own way against a tyrannical federal government," Golay said. Owen Golay's friend Bruce Peterson, 65, shares his fascination with Civil War history and memorabilia. Peterson spent part of his childhood in Louisiana, but now he lives about an hour away from Golay in the small town of Earlham, Iowa, where he sometimes flies the Confederate flag. During a recent visit to his friend's front porch, Peterson says most of the Iowans he's known who are into Confederate symbols also feel a solidarity with the Confederate South. "They wanted their independence, they wanted a smaller government. I find that a lot in people, it's just that rebelliousness," Peterson said. Golay insists the South was misunderstood, and rejects the consensus among professional historians that slavery was the primary driver of the Civil War. He says the flag isn't about race for him. "As far as the racism goes, I dismiss it, because I'm not racist whatsoever. That flag doesn't mean that to me," Golay said. But it does for many others, including historian Randal Jelks, professor of American Studies and African and African American Studies at the University of Kansas. Jelks says the Confederacy was set up to protect slavery, and its flags will always represent that. "It is about a certain way of life that people have a nostalgia about, and that's always dangerous," Jelks said. "Because as I tell my kids all the time, the good old days weren't as good as people claim they were, they just imagine them to be." Still, that nostalgia seems to be growing. Last year, there were reports of several incidents where supporters of then-candidate Donald Trump displayed Confederate symbols at pro-Trump events nationwide - including in the North. In one case, a police officer in Traverse City, Mich. was forced to resign after pulling up to an anti-Trump rally in a truck displaying a Confederate flag. Protestors said he revved his engine at them. "They have sort of appeared in places that I didn't ever imagine them to be," said Jim Downs, a history professor at Connecticut College and author of Sick From Freedom: African American Illness and Suffering during the Civil War and Reconstruction. He's also observed an increase in Confederate symbols north of the Mason-Dixon line. Downs grew up and went to college in Philadelphia, and says he doesn't remember ever seeing those symbols in his youth. He now notices them on the backs of trucks and in dormitory windows far outside the Deep South. "The Confederate flag as a symbol has sort of appeared throughout the North, and it's actually quite contradictory to the whole point of what it represents," Downs said, noting that many Northerners died defending the Union in the Civil War. Sales of Confederate memorabilia underline the northward trend. Dewey Barber, owner of Dixie Outfitters in Odum, Ga., which sells a variety of items, from coasters to tote bags emblazoned with Confederate symbols, estimates only about 5 percent of his customers were Northerners when he started his business three decades ago; now they make up about 20 percent. Barber credits the Internet and alternative media with spreading interest in Southern history and Confederate symbols beyond the former Confederate states. "The rebel flag is a manifestation of that, I think. It's taken on a larger meaning and it's not just from people that live in the South anymore," Barber said. Barber says he saw a 10-fold spike in sales after a white supremacist known for his embrace of the Confederate flag shot and killed nine people in a historically black church in Charleston, S.C. in 2015. He says he was "disturbed" by the murders, but says the controversy was "great" for business. All right, so there is no shortage of controversy over Confederate symbols in the South. Despite local protests, New Orleans recently began removing four of its Confederate monuments. But it seems that Confederate nostalgia is also alive and well among some Northerners, as NPR's Sarah McCammon reports. 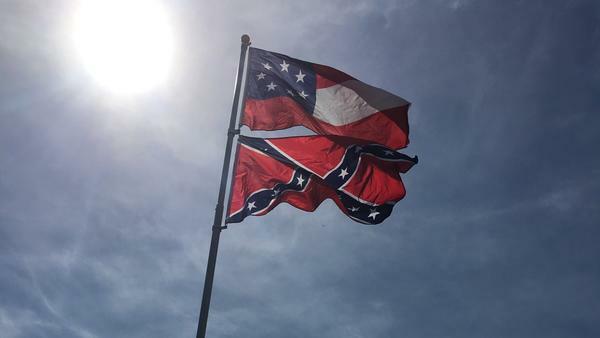 SARAH MCCAMMON, BYLINE: When you ask Owen Golay about the two Confederate flags he flies in his front yard, he sounds a lot like some Southern defenders of Confederate symbols. OWEN GOLAY: It stands for heritage. It's a part of our history. MCCAMMON: But not Golay's history. GOLAY: I was born right here in Iowa not 40 miles from here. MCCAMMON: Golay is 60 and lives in rural Pleasantville, Iowa, about 40 minutes from Des Moines. Aside from some people in his family tree who fought on both sides in the Civil War, he has no real ties to the South. His friend Bruce Peterson spent part of his childhood in Louisiana before eventually settling in Iowa. He also sometimes flies the Confederate flag. Sitting on Golay's front porch, Peterson says most of the Northerners he's known who are into Confederate symbols feel a solidarity with the Southern cause. BRUCE PETERSON: They wanted their independence. They wanted a smaller government. I find that a lot in people. It's just that rebelliousness. MCCAMMON: They aren't alone in their nostalgia for the flag. Last year, several incidents were reported when supporters of then-candidate Donald Trump displayed Confederate symbols at pro-Trump events. In one case, a police officer in Traverse City, Mich., was forced to resign after pulling up to an anti-Trump rally in a truck displaying a Confederate flag. Protesters said he revved his engine at them. If sales of Confederate memorabilia are any indication, Northerners are in the market for it, too. Dewey Barber is the owner of Dixie Outfitters in Odum, Ga.
DEWEY BARBER: We also sell car tags and flags, cups, coasters, a lot of different items with the Confederate flag on them. MCCAMMON: Barber estimates only about 5 percent of his customers were Northerners when he started his business three decades ago. They now make up about 20 percent. He credits the Internet and alternative media with spreading interest in Confederate symbols above the Mason-Dixon line. BARBER: The rebel flag is a manifestation of that, I think. It has taken on a larger meaning. And it's not just from people that live in the South anymore. MCCAMMON: In fact, Barber saw a tenfold spike in sales after a white supremacist known for his embrace of the Confederate flag shot and killed nine people in a historically black church in Charleston, S.C., in 2015. He says he was disturbed by the murders but says the controversy was good for business. Owen Golay back in Iowa insists the flag isn't about race for him. Golay says his interest in Civil War history and symbols deepened during the Obama administration when he felt the president was overstepping his executive authority. GOLAY: As far as the racism goes, I dismiss it because I'm not racist whatsoever. That flag doesn't mean that to me. MCCAMMON: But it does for many others like historian Randal Jelks, who teaches American studies at the University of Kansas. He says the Confederacy was set up to protect slavery, and its flags will always represent that. RANDAL JELKS: It is about a certain way of life that people have a nostalgia about. And that's always dangerous because, you know, as I tell my kids all the time, the good old days weren't as good as people claim they were. They just imagine them to be. MCCAMMON: Jelks says while for some symbols like the Confederate flag may mean standing up to the federal government, for many others they represent racism and slavery. Sarah McCammon, NPR News. (SOUNDBITE OF THOMAS VITALI'S "REBECCA'S EYES") Transcript provided by NPR, Copyright NPR.